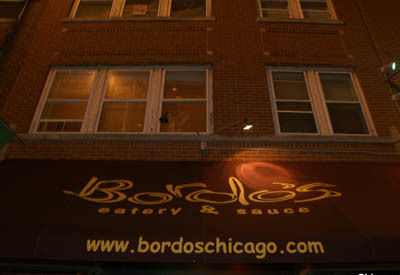 BORDOS is a Chicago staple, with its trendy space and great atmosphere. The crowds are always good looking, and the waitstaff is happy to help you find just the right drink to set your night off perfectly. We would highly recommend any of their martinis and cosmos, but for the record you really can't go wrong with anything on the drink menu. Though Bordos is a great neighborhood type bar to hang out in, the food is much more than you'll find at the typical bars in the area. Sure they've got the usual pizzas and burgers, but they've also got pastas and entrees that you'd never expect to find in a place like this. Delicious and highly recommended!